I don’t shop a lot of food at the grocery since I used to throw away expired foods which I doesn’t even realized that I bought till I search the fridge. Sayang naman. I would often feel guilty so I only buy whenever I have to. Most trip to a grocery store would often lead me later on to any Filipino convenience stores where I can only find some of my favourite Filipino foods. Every trip seems like a quick trip to the Philippines. Everything reminds me of home. The Bread Pan, seafood noodles, Putoseko. Don’t forget the Pandesal and Spanish bread. Nakakagutom magkwento. 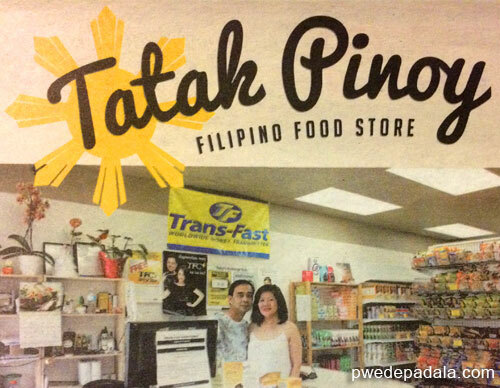 Filipinos don’t only come to Filipino convenience stores to stock up their pantry with foods known since the era of Patintero and Tumbang Preso. If I’m not busy feasting my eyes on sweets and breads, I am often surprise to know various services offered in the store. 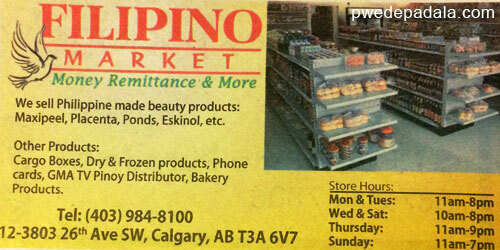 In this post I listed the Filipino convenience stores in Calgary and whatever else you can spend on other than food and remittance. If you are a business owner and would like to have your store in the list, send the business information. I’ll gladly update the post. 4. Jade’s Meatshop & Groceries Inc.
Groceries: Beef, chicken, pork, goat, fish, seafood etc. This is where I applied for TFC so I can watch ANC On The Money and Maalaala Mo Kaya (para mag senti at mainspire). Service: Food distributor, money remittance, and Philippine National Bank (PNB) contact. You can buy a balikbayan box of Forex Alberta in three different sizes. Related Post: Open a PNB Account or other Philippine bank Account in Canada. I’ve only been to two stores out of six maybe because I don’t need to buy a balikbayan box. I send my remittance and pay the Pag-IBIG monthly contribution online. I almost forgot to mention, pick up the FREE newspapers to stay up-to-date about the politics, entertainment, immigration and concerts of your favourite artista. (Ang mahal naman ng ticket). Among the list of stores, which one do you frequent? Have I missed any store that you love to visit? Let me know about it on the comment.